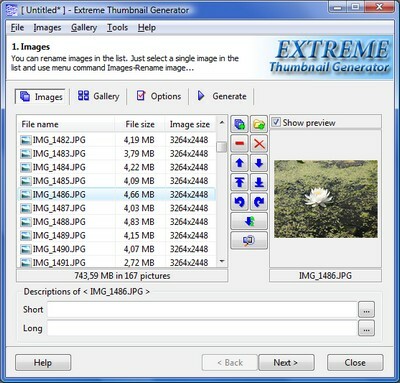 Extreme Thumbnail Generator allows you to do batch image processing with all images in the project. First you have add all images to the Extreme Thumbnail Generator project. You can add individual images using the button or you can add all images from any folder (and sub-folders) using the button. You can easily change brightness, contrast, saturation and other options of all images in the project. Select any image in the image list and click the button. It will open the Image effects window where you can adjust all necessary parameters, check the Apply selected effects to all images in the project box and click OK button to apply selected parameters to all images. If you want to resize all images, then go to the Options step and select the Images tab. In the Resize original images section check the Resize images box and enter maximum image width height in pixels. All resized images are scaled (no parts of image is removed). 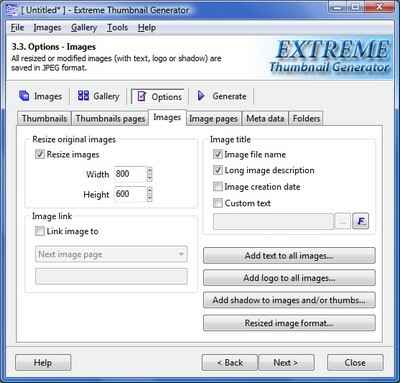 Extreme Thumbnail Generator allows adding any text you want to all processed images. For example you can protect all your images with a copyright statement. Just click the Add text to all images... button to open the Overlay text window and enter as many text elements as you need. Please note, that Extreme Thumbnail Generator can automatically insert any image information, like image size, image creation date, EXIF tags and many others, into those text elements. Plus, you can draw any image (like your logo) on every processed image. Simply click the Add logo to all images... button to open the Overlay logo image window where you can select which image or images must be added to all processed images, select their position and transparency level. Also there is an option to add shadow effect to all processed images. Click the Add shadow to images and/or thumbnails... button to open the Shadow effect settings window where you must check the Add shadow effect to full-size images box and select shadow color, size and position. After all desired options are set go to the Generate step and click the Generate full-size images only... button in the Image processing section to start batch image processing. All processed images are saved in JPEG format. You can change the JPEG quality level along with the resize filter (for resized images) by clicking the Resized image format... button.